So tonight my husband was wanting to BBQ and I was wanting some seafood. So I went to the store and brought back some pork chops and some shrimp (this will happen when you turn a Cajun girl loose in the store…) and here we are with BBQ shrimp. You don’t actually BBQ the shrimp. And there is no BBQ sauce involved. Hence the pork chops. That man wanted to grill something and I knew me calling some BBQed when he didn’t actually get to man the grill would not fly. So the recipe called for something like 4 pounds of shrimp, but with only big daddy and I eating the shrimp (we have one allergic and the others just would rather not) I decided to cut it way down. I will give you that version. You can always double or triple it or so on. I found this recipe on Pinterest and modified it. 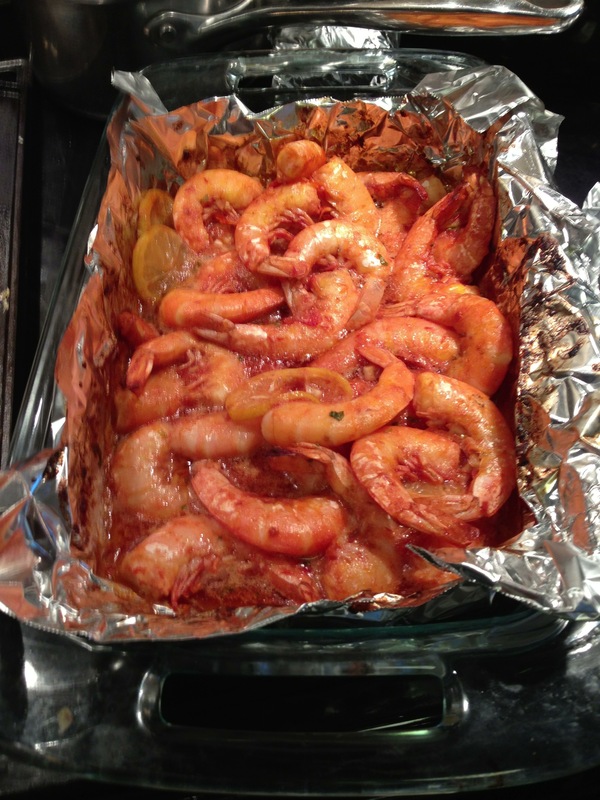 Put your shrimp in a foil lined baking dish. Whisk together the remaining ingredients and pour over the shrimp. Refrigerate for about 30 minutes. Then turn shrimp to make sure the other side is coated. Let them chill in fridge a little longer. As those babies are cooling their jets in that yummy sauce, preheat your oven to 400 degrees. Pop your dish full of shrimp into the oven and cook for 10 minutes. Turn the shrimp over and cook 10 more minutes. Let them sit for about 5 or 10 minutes and then serve with some crusty French bread. Yummmm!